Sparkling hard cider may hold only 1% of the beer market, but sales grew 84% in 2012, eclipsing by far the 17% growth rate for craft beer. A well-made cider is certainly a thing of beauty, but even a middle-market commercial cider offers a welcome respite from high amplitude hop bombs. In the UK and Ireland though, beer and cider taps exist as equals at the pub. Locally crafted brands of cider have been there for decades. The key to these brands’ drinkability is the care that goes into the blending of juices that create a full-spectrum flavor. 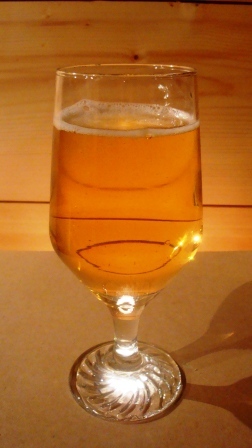 English ciders are known for the blend of varieties specifically grown for the purpose. These apples are virtually unobtainable outside the small areas in which they are grown. It’s possible to make a good beverage without them, however, with a little creativity. The recipe for this cider starts with a base of Cortland, Red Delicious and Gold Delicious sweet apples. Gravenstein and McIntosh varieties provide aroma, and Jonagold offers tartness. Crab apples substitute for English cider apples in furnishing tannins, as well as additional acid. The apples were milled, and pressed to express blended juice, which was pitched with White Labs’ WLP775 English Cider yeast. A malolactic culture was added to the secondary fermenter to make the acid flavor more smooth. Oak chips contribute a mild, woody barrel taste and aroma. While this doesn’t qualify as an English Farmhouse Cider–it was sweetened a bit with wine conditioner and carbonated with the Charmat process, it is an excellent brut with about 1% residual sugar, well-balanced acid and a full, rich vanilla flavor with very light oaky background notes. The aroma is quite apple-y, and an empty glass retains this for quite some time. It’s disappearing from the cellar very quickly. This entry was posted in Uncategorized and tagged ale, beer, English cider recipe, fermentation, hard cider, homebrewing, umami.